SANTA ROSA ISLAND – On Aug. 13 more than 120 people arrived on Santa Rosa Island to join in the dedication and open house for the new Santa Rosa Island Research Station. 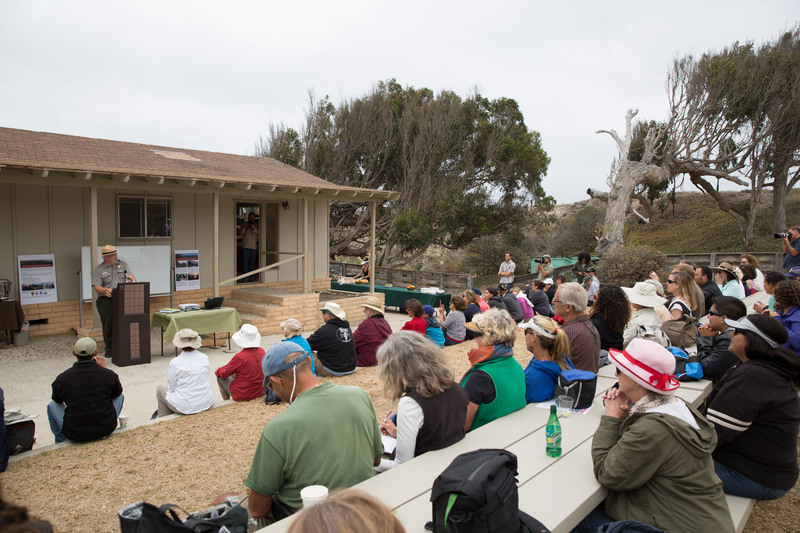 Created through the partnership between Cal State University Channel Islands (CSUCI) and the Channel Islands National Park (CINP), the field station promotes research, restoration, and education. Located in the historic Vail and Vickers ranch bunkhouse that has been revamped to include sleeping quarters for 22 students and professors, a classroom, laboratory and room for sorting, identifying and storing artifacts, the research station marks a new era on the Santa Rosa Island. “We have already had 30 professors, 150 students and 10 different organizations working on the island,” said Santa Rosa Island Station Manager Cause Hanna. There are eight disciplines for study available to those who come here including, anthropology, art, biology, business, communication, English, environmental science, and resource management. In addition to its location within a national park and national marine sanctuary, Santa Rosa Island offers marine and terrestrial species and other endemic animals and plants found nowhere else in the world; and, a13,000-year record of human occupation. A project of note is a long-term debris-monitoring study to collect, identify and catalog trash that washes ashore. It can then be compared with other environmental protection sites being monitored across the nation. Another key project is the monitoring of the rocky intertidal zone to record the wasting syndrome that has caused an enormous die off of sea stars along the North American Pacific. The project will help to assess the syndrome and possibly help to identify the ecological consequences from the loss of these species. “The university has the manpower to research and develop these projects and work closely with the national park and other agencies to identify their priorities, which leads to the study of key issues,” said Hanna. The process, according to Hanna, is that the student starts by identifying a particular problem and with a mentor develops the study. At year’s end the student writes a report of their findings. In turn, these completed projects will provide meaningful information to CINP while benefitting the students.